Hops : Wye Challenger and Fuggles. 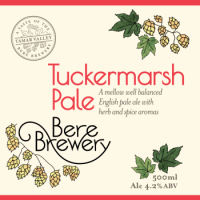 A gentle and easy drinking well balanced pale ale with subtle fruit and spice aromas from traditional English Fuggles hops. Bitterness from the hops is balanced by sweet caramel flavours from the crystal malt. Water, Maris Otter Pale Malt, Crystal Malt, Wheat Malt, Hops, Yeast. No chemical additives. Suitable for vegans. Tuckermarsh Quay, busy in the 19th and early 20th centuries with the noise and bustle of trade, now a tranquil haven on the banks of the meandering Tamar, silver in the sun. Taproom Evening April 27, 2019 at 4:00 pm – 9:00 pm With our latest beer, Collytown Blonde, available on cask.